With our presenters Maurie Dynon and Adrian Sartori (Guildford-Upper Loddon Landcare), Pat Radi-Mansbridge (Bushco Land Management), Patrick Kavanagh (Newstead Landcare) and David Cameron (Arthur Rylah Institute, DEPI) the focus was on managing weeds in restoration projects, with a specific look at the challenges of working in creek-line areas and riparian zones. These areas are generally the most fertile (and potentially the most bio-diverse) and also the most disturbed by human activity, thus ideal sites for weed invasion. We also explored the importance of working with neighbouring landholders and the role of Landcare. As usual, a mix of ecological theory and practical tips, techniques and pointers were provided by our excellent presenters. 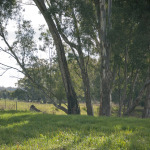 We visited three sites, in various stages of restoration and each with unique challenges – the Jim Crow Creek where Guildford-Upper Loddon Landcare have removed willows and fenced off the creek from stock access, allowing the redgums and other natives to re-establish on the Sartori family property. This stretch of creek at Strangways was a small part of the larger 26km project. 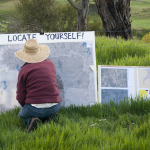 On a smaller but no less significant scale, The Newstead Landcare group have focussed attention in a red-gum sanctuary at the confluence of the Loddon River and Muckleford Creek. Rather than whole-scale action, the group are taking a softer and gentler approach to restoration at this magnificent site. Thirdly, Newstead’s Rotunda Park, is a great example of a significant landscape brought ‘back from the brink’ and now well on the way to resembling its former self (Alluvial Terraces Herb Rich Woodland/Creekline Grassy Woodland Mosaic EVC) – and as a well loved piece of bush to the locals. Thanks to Adrian, Maurie, Patrick, Pat and David for an information-filled, entertaining and very practical session on working with weeds at the property and landscape scale. 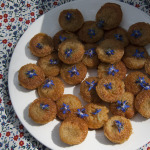 Read Deb Wardle’s account of the day below the links and photos on this page. This was the last session of the 2014 series. We will be running the program in a similar format in 2015. The Weed Society of Victoria – a good source of information and resources. DEPI Weeds site – has an A to Z of weeds, information on management and Information on the volunteer network of Weed Spotters assisting in protecting Victoria from the threat of weeds. Invasive Species Council – community based group campaigning for better laws and policies to protect the Australian environment from weeds, feral animals and exotic pathogens. 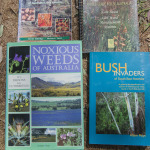 Weeds of National Significance – – an excellent website with downloads on management of a range of species. The Weeds Network – designed to help stakeholders in natural resource management learn more about invasive plants and weed control systems. 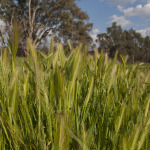 For all things Landcare, go to the Connecting Country Landcare Pages – which also contain weed management info sheets for specific plants. 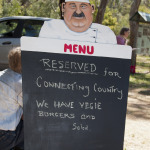 Contact Max Schlachter, Email: max@connectingcountry.org.au, or phone: (03) 5472 1594 for more info on Landcare across the Mount Alexander region. David Cameron David Cameron from Arthur Rylah Institute shares some of his ecological knowledge. Another cracker of a day, artfully organized, and sadly the last in this wonderful series of informative workshops. The group of participants was carefully shepherded across three sites around Newstead district. With a top line-up of speakers, the theme of the day emerged; the need for strong community cooperation for widespread weed control, whether this is in public areas or on individual properties. Acknowledging the broad range of definitions of “weeds”, we saw examples of large-scale cooperation to tackle large-scale weed problems. 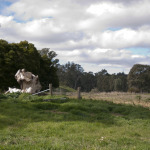 The group started out on the side of Jim Crow Creek, along the Newstead–Daylesford road, on the Sartori’s grazing, hay and wool property. 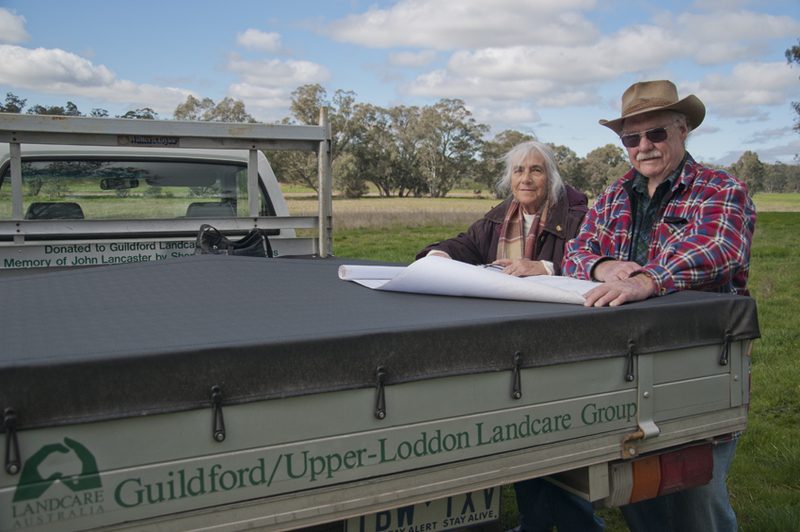 There Guildford Landcare stalwart, Maurie Dynon, told his story of Landcare’s approach to creek-side fencing and willow removal along more than twenty kilometres of the Jim Crow. Frogs and birds chorused, the pasture was leaping in the Spring warmth – and so were the weeds along the creek, as land owner, Adrian Sartori acknowledged. Fencing this unique waterway against stock damage so as to enable revegetation started in 2001, with a scientific study to establish baseline knowledge of vegetation and fauna. 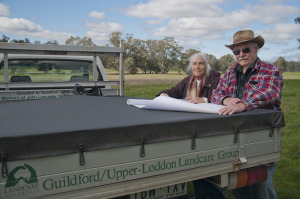 The project of willow removal and fencing from Shepherd’s Flat to where Jim Crow Creek meets the Loddon River has been an ongoing community development project, steered by Maurie and the Guildford Upper Loddon Landcare group and involving over 30 landowners. Funding and support from a range of State and Federal government bodies – including Dept of Sustainability and Environment (through numerous name changes), Parks Victoria, Catchment Management Authorities, to name some, was also essential. Maurie’s catch cry was patience, persistence and to ‘never say no to a cup of tea.’ Talking honestly of the advantages and disadvantages for landowners involvement in the project gradually paid off, as people took on that it was not only about improving water quality on their land, but had wider advantages, even increasing the water flows past Adelaide! Irreparable damage from gold dredging along Jim Crow Creek, which finished in the early 1950s, decimated much of the creek ecology and flows. Efforts to restore diversity and natural vegetation to improve the health of the creek has taken years of persistence and the work goes on. There have been numerous offshoot projects (Yandoit Creek improvements) as well. Overall benefits are still being monitored, but include reducing sediment discharge into Cairn Curran reservoir, as well as the immediate improvements to the creek flows. Adrian Sartori stated that the fencing definitely improved stock management along the creek flats. ongoing weed control of Gorse, Cape Broome, thistles remain a challenge as native vegetation regenerates. SITE 2: Loddon River at the confluence of Muckleford Creek. Here Patrick Kavanagh from Newstead Landcare Group explained the long term work being undertaken. Sparked by the Newstead 2021 Plan, work to look after ‘the river’ became a high priority. With well-established River Red Gums (Eucalyptus camaldulensis) in abundance, the aim of this project has been to establish native understory and grasses to crowd out weeds. Exclosure plots have been a major strategy, slightly deterring the sleek Black Wallabies from nibbling plants. Most success has been with poas, Carex and sedges, with some wattles and blackwood becoming established in a mosaic pattern. Patrick referred to a stand of naturally growing poas in the Franklinford Cemetery providing inspiration. 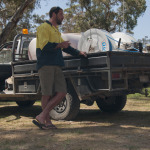 Newstead Landcare aims to “be here for the long term, so we bite off small bits at a time,” said Patrick. The work ahead of them is daunting, but inspiring nonetheless. Pat Radi-Mansbridge from BushCo discussed ways of utilising range of chemical deterrents in areas where any other mechanical options to weed control are not viable. For Pat weed control is about habitat preservation, so his children will be able to see the plants and places that he has. Already some are gone. His practical knowledge and approach to using chemical spraying for weed control covered a wide range of weeds. Pat particularly raised the question of blurry definitions of “weeds”, as different plants are difficult or welcomed in different contexts, and according to use, function, or even our beliefs. Contrary to Maurie’s previous comments, Pat believes that stem-injection of willows is a better method than physical removal, as it reduces re-shooting from broken twigs. He discussed methods for treating hawthorn, pine, elms, poplars, gorse, broom, blackberries, through a mix of stem injection in Spring, cutting and painting the stump with poison, physical removal and then using less spray on regrowth. Pat emphasised trying to ensure that if the weed removal was destroying habitat, to try to have alternative planting established as replacement habitat well prior to the weed removal, (eg, particularly with gorse, which is often an important bird habitat). Research the best seasonal time for specific weed control. Winter weed control of bridal creeper, watsonia or gladiolus (prior to flowering) was recommended. Knowing the correct treatment for dicotyledon and monocotyledon plants is also important. The key message was to match the spray to the weed and the situation. There was some discussion of fire (hot or cool fires) as a weed control, acknowledging that it is often followed by regrowth of both some native and/or more weeds. Pat recommended all the safety precautions, protective clothing and equipment, (masks, goggles, gloves, boots and long sleeves and pants) always be used with use of chemical spraying. Here Patrick Kavanagh briefly told the story of controlling the predominance of bridal creeper over the past 14 years. Starting with a management plan and then mobilising Green Corps and other community groups (eg, Newstead Primary school), Newstead Landcare group has gradually improved this site immensely. 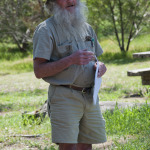 The final speaker for the day was David Cameron an ecologist and Senior Botanist for DEPI. He has worked significantly on the Victorian Biodiversity Atlas. 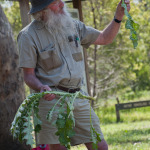 He distributed a plant list of what we could expect to find in the Newstead district. David reinforced previous comments about applying specific control methods for particular weeds – deciding which are intractable (eg, in some cases capeweed), and those where effective treatments are possible. He mentioned the art of consciousness; of seeing weeds in a landscape, and the importance of educating children to recognise native and introduced plants. From an ecological perspective, looking for the cause of weed infestation is important, rather than just trying to treat the weed. Look at the general condition of the environment. ; eg minimising soil disturbance which allows some weeds to start. Understanding the way of dispersion is important, as it is the dispersion which may need to be controlled. Understanding the full cycle of the weed life is essential to target controls effectively. David discussed the role of Ecological Vegetation Classes or EVC’s (which he assisted in introducing). Ecological Vegetation Classes descriptions will assist in knowing what balance and proportions of plant types to re-introduce when weeds are being removed, in various landscape types. He noted that there is more scope for retaining landscapes where there are remnants of original vegetation remaining, even in mosaic type patterns. These are essential to maintain, to retain increasingly rare and threatened species. Weed controls in bushland remnants are important. He also noted the vital importance of maintaining the bryophytes, soil crusts (fungis etc) that hold soil surfaces together, particularly in dry country. 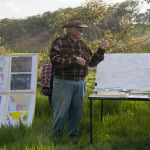 He noted the origins of the Bradley method of weed control (from the Bradley sisters) of creating small mosaics of native plants at the edges of the invasion front, which can then infringe into weedy areas. 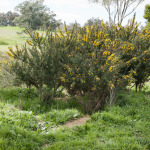 For example, this method would be well used in treatment of St John’s Wort. David noted that there is still much science to be done on biological controls of many weeds.